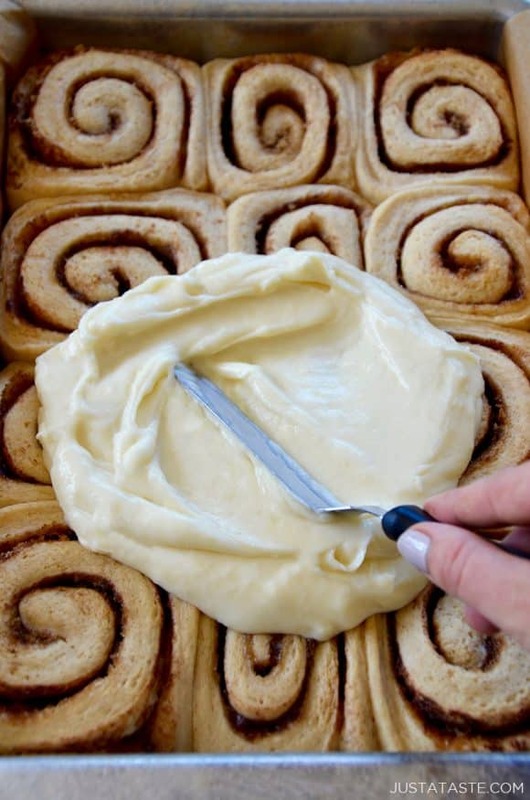 Take the stress out of the ultimate breakfast treat with an easy recipe for Make-Ahead Cinnamon Rolls with Cream Cheese Frosting. We all have that airport food vice, the one item we make a beeline for once cleared through security. For me, it depends on the airport. At Chicago’s O’Hare Airport, it’s Garrett Popcorn (a mix of their caramel corn and cheesy popcorn, to be exact). At New York’s JFK Airport, it’s a Shake Shack burger and fries. And at just about every other airport in America, it’s a Cinnabon cinnamon roll. I can sniff out the wafting aroma of warm butter mixing with cinnamon and sugar at least 14 gates away. I walk closer and closer, as the smell intensifies. And then, inevitably, I arrive at the Cinnabon counter and a friendly face is rolling, filling, slicing and icing cinnamon roll after cinnamon roll after cinnamon roll. Are homemade cinnamon rolls a labor of love? You bet! But with a few simple tricks for how to successfully start and then stop the prep, you can in fact master Make-Ahead Cinnamon Rolls. Check out the swirled beauties below. They’re all ready for stashing in your fridge, which means you’re 90% of the way there. Then all that’s left to do in the morning is pop them into the oven and start sippin’ on your mimosa while you whip up the topping. 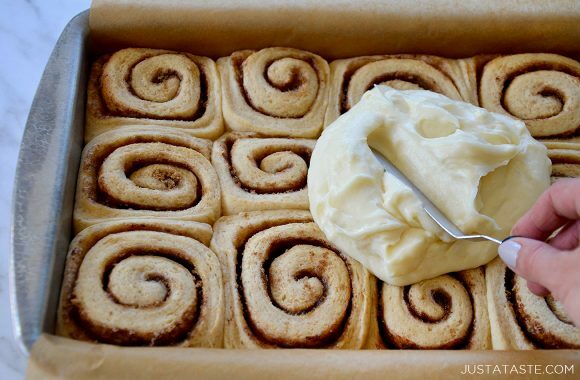 Warm cinnamon rolls, meet the lightest, tangiest cream cheese frosting to ever slather your buns. And that right there is a big-time breakfast win. 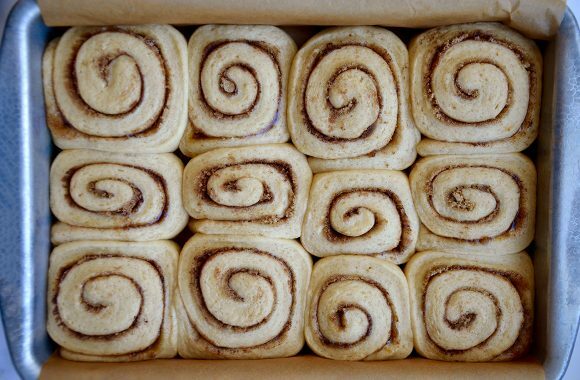 Cinnamony, swirly, buttery, better-than-Cinnabon perfection. Warm the milk and butter on the stovetop or in the microwave until it is warm but not hot to the touch (it should be below 110°F). Add 1 tablespoon of sugar and the yeast to the milk, stirring to combine, then set it aside for 5 minutes. In a stand mixer fitted with the dough hook attachment, mix together the flour, cinnamon, and salt. Add the yeast mixture and eggs and mix for 8 minutes until dough is smooth. (The dough will be slightly tacky.) 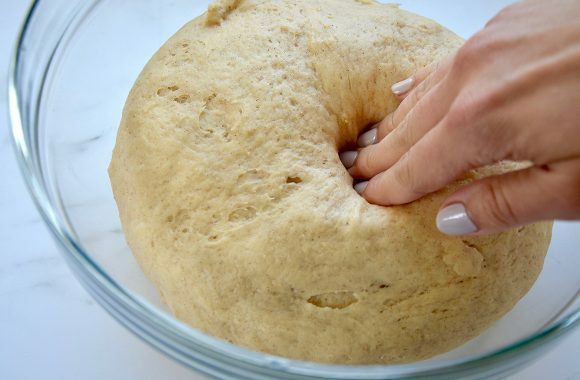 Place the dough in a clean, greased bowl and cover it with plastic wrap. Place the bowl in a warm, dark place to proof until it has doubled in size, about 2 hours. Line a 9×13-inch baking dish with parchment paper. Lightly flour your work surface then scrape the dough out, and using a rolling pin, roll the dough into a rectangle that is 1/4-inch thick. Brush the melted butter generously over the dough. In a small bowl, whisk together the brown sugar, sugar and cinnamon then sprinkle it atop the melted butter. Starting at the long edge of the rectangle, roll the dough up into a tight log, then using a sharp knife, slice the log into 12 2-inch rounds. 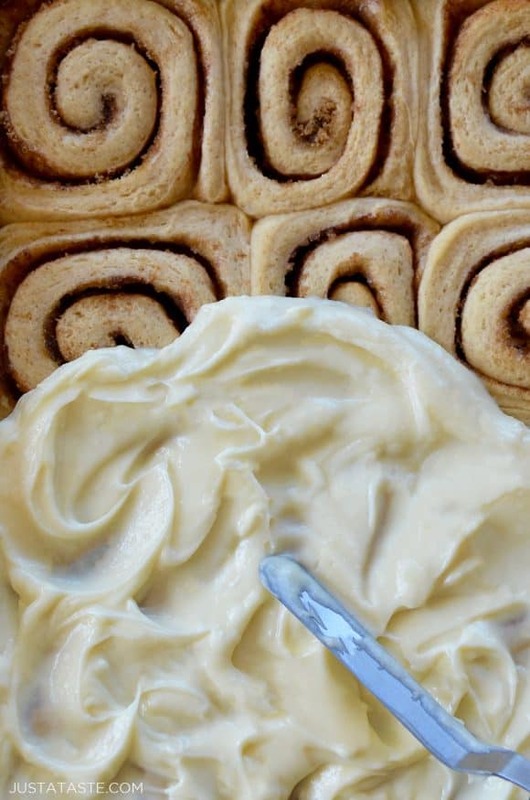 While the cinnamon rolls bake, make the cream cheese frosting. 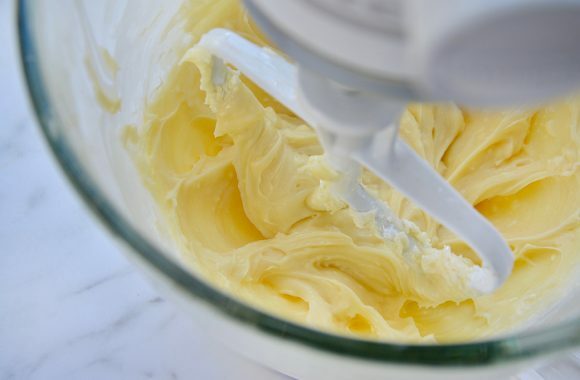 In the bowl of a stand mixer fitted with the paddle attachment, beat together the butter and cream cheese until smooth. Add the vanilla extract, buttermilk, salt and confectioners’ sugar and beat until combined. Spread generously over completely cooled cinnamon rolls. Best served immediately. Next Post: Tracy Morgan Plays an Ex-Convict With Food Truck Dreams on The Last O.G.